By the 7th of April Operation Michael had ground to a halt. Although von Hutier’s 18th army had had a spectacular advance, they now formed the weal underbelly of the newly created salient. 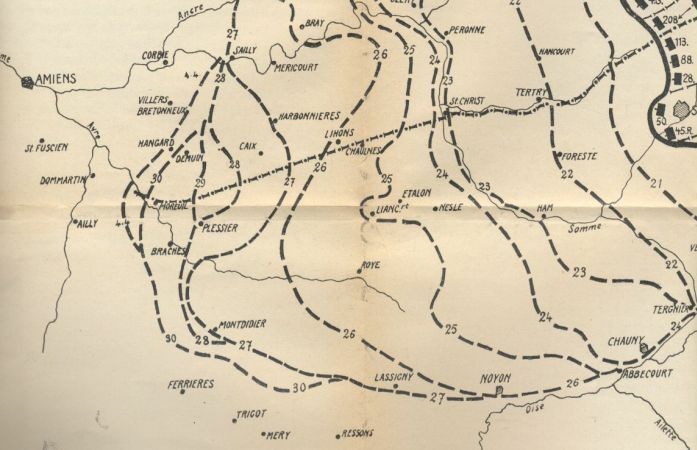 The planned French counter-offensive between Amiens and Montdidier was cancelled due to the pressure put on the allies by the German offensive in Flanders on the 9th of April. Although the major French offensive was cancelled they kept the German troops in the salient under a constant heavy bombardment. At the same time the French undertook numerous local attacks in an effort to break the moral of the salient occupants. Above: A map showing the progression of the German divisions in the "Kaiserschlacht". It well illustrates the "soft underbelly" of the 18th Army. In the bottom right hand corner the Oisne-Aisne bend can be seen that the 7th Army would soon take in "Operation Archangel", a further measure to protect the 18th Army's southern flank. Although no major actions took place Cron describes it as one of the most heroic feats of the German Army. "Often it called for more courage and determination to lie exposed on the sleet whipped battlefield, in muddy holes with little protection from the bursting shells while the canons thundered and hungry bellies rumbled, fighting of enemy attacks, than it did to participate in an assault after with high spirits. Due to the determined fighting by the defenders the French were forced to divert many men to cover the salient. Fighting not only defensively the Germans launched local attacks of their own, on occasion taken important objectives. Noyon and Montdidier were the main hotspots with wedges being driven into the French lines, forming dangerous bridgeheads. This caused the enemy to concentrate their attacks on these sectors. The German regiments in the line held their positions their losses mounting steadily and with no hope of replacements. The extent of the losses can be best imagined when one views the losses of the 6th Bavarian Reserve Division. Before its relief on the 27th of April the division lost 60 officers and 3000 men at Montdidier. 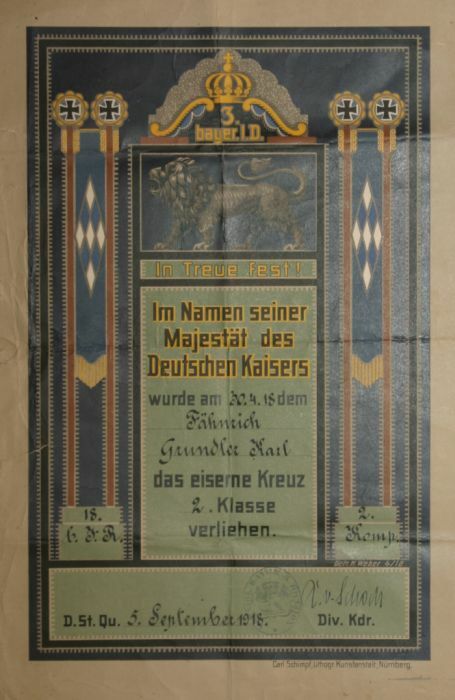 Arguably the most decorative Iron Cross document printed, a special version for the Bavarian 3rd Infantry Division. The document was signed on the 5th of September 1918 by Generalleutnant Ritter von Schoch, Kommandeur der 3. bayer.I.D. The 3rd Bavarian Division fought at Noyon and Lassigny in April-May 1918.